Many supermarkets, specialty shops and bakeries now sell gluten free bread. Some make it themselves and others stock bread made elsewhere. Some of the bread is fantastic, while other bread reveals the challenges involved in baking without gluten. 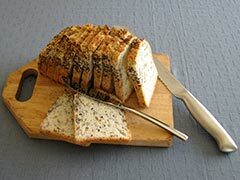 Bakeries that carry gluten free bread or other products can be found in the "bakeries" section under "specialty shops", specific breads are listed here.